The Honey Ants are in the Ranch! The Pmds are still around as well. You will have to from a #16 to a #20 but still plenty of bugs around. Caddis are also around in good numbers. I have some great evening fishing with a # 18 peacock spent partridge caddis. During the day the hopper fishing has also been very good. Don’t write off the callibeatis. I would have both duns and spinners. Some #16 and #18 rusty spinners is also a good idea. The Box has not changed much. I would stick with the smaller beads and hoppers. 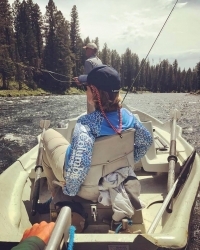 The flows in the box have remained consistent and so has the fishing. Small beads heads like #18 brown zebra midges and #16 Ricks Tungsten. I would also have #10 Moorish Hoppers. Don’t rule out a first light streamer run in the box. You will have it to yourself and it can be very productive. Again I don’t have new info on the lower Henry’s Fork. The dry fly fishing continues to be good early in the morning and again in the evenings. I would look for tricos in the morning and then caddis. I would also have plenty of hoppers on the lower river. A hopper dropper combination has been very productive on the lower river. The Teton continues to fish very well. Great hatches of Pmds! If you have never experienced this river than I would highly suggest you give it a try this year. Make sure you have plenty of your favorite Pmd patterns. I like #16 No-Hackles and limestone cripples. Some #16 rusty spinners is also a great idea. Don’t forget your hoppers! 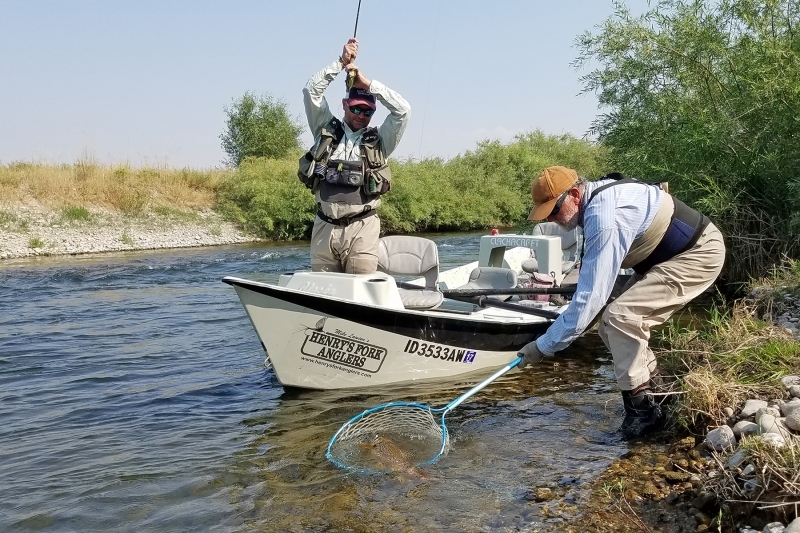 Dry fly fishing has really picked up in the riffles and on the banks. There have been some good hatches of Pink Alberts mixed with PMDs at mid-day. It is better if you get some clouds. Hopper/dropper rigs have also been working well. I would keep an eye out for the mutant golden stones, but as of today if you’re planning a trip to the South Fork make sure you have plenty of nymphs with you. I would have rubber legs and zebra midges with you. Don’t be afraid to try a hopper dropper rig on the banks or over the drops. The Madison continues to fish very well both early and then again late. The fishing in the afternoon continues to be a little tough as the water temps are getting a bit on the warm side. I would fish mutant golden at first light and you will also see pmds in the mornings. In the evenings the caddis fly hatches have been great . The park has been fishing very well. 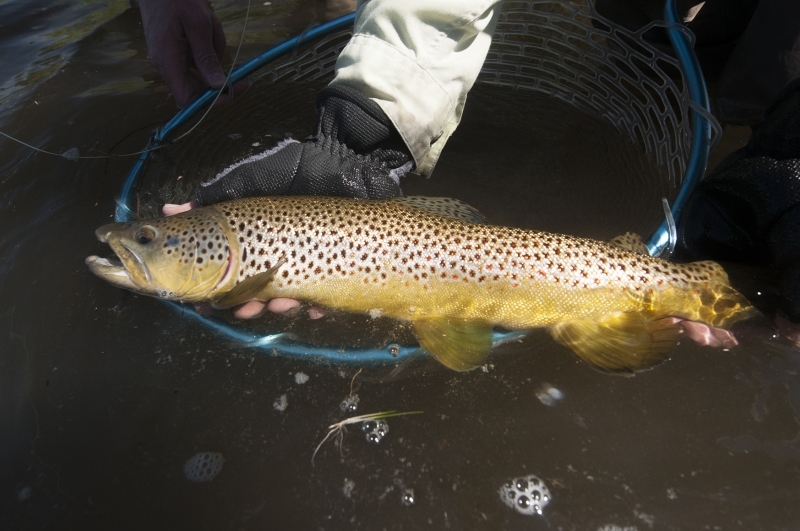 The Yellowstone River continues to drop and there are still some great hatches. This is also a great time to fish streamers . As the water continues to come down watch for the mutants. I would also have pmds and green drakes. I would probably stay off The Fire hole for the time being as temps will make the fire hole tough for the next couple of weeks. Slough creek continues to fish and I would take a look on the lower end of slough creek, some of my favorite water to fish in the park. I would avoid Henry’s lake for a bit until this algae bloom dies off. 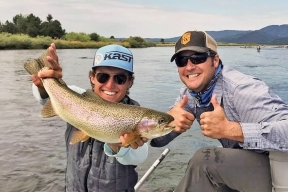 Hebgen continues to fish well as does Island Park. The Beauty of Island Park this year, there is still a lot of water! I would look at fishing from McCrea’s Bridge down to about lake side. Hopper Droppers will work well. Try a purple chubby with a #16 red zebra dropped about three feet down.